From time to time, all photographers use their photography equipment outside and they all encounter the same problem: how can you keep my equipment dry while it’s raining? Hide is one option, but this could mean that some nice shots are missed. Standing in the rain without protection, could cause damage to your camera and lenses. Therefore some photographers just use a piece of cloth or a plastic bag to cover their lenses. These are really cheap solutions and you will certainly agree that expensive equipment is worth to be protected in a decent way. 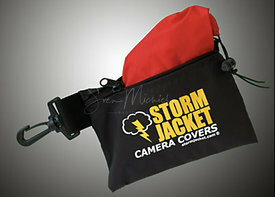 Some time ago, Vortex Media launched a range of rain capes called “Storm Jackets”. 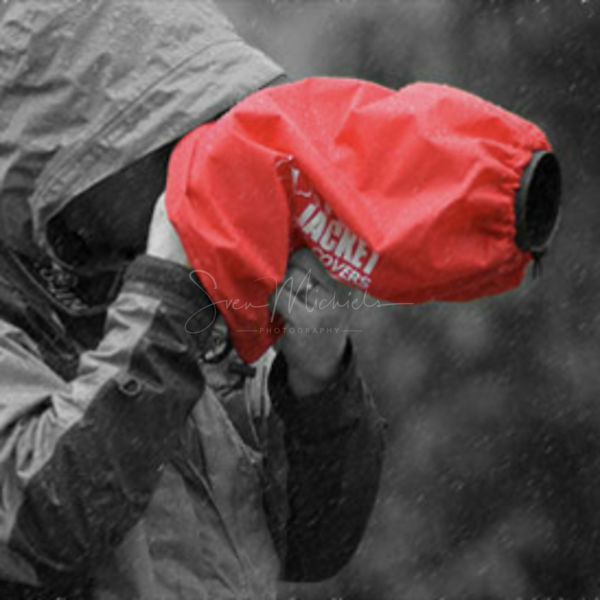 These are simple rain capes, offered in different versions, colors and sizes to protect your camera and lens against rain. The Storm Jackets are available in 2 versions: Standard and Pro. The only difference between both is that the Pro-version has a Velcro opening at the bottom of the rain cape so you can fix your lens-camera combination on a tripod. Personally, I prefer the Pro-version especially when using lenses that have their own foot. All rain capes are available in different colors: black, camouflage, red and yellow for the standard version and black and camouflage for the Pro-version. Personally, I don’t like heavy colors, so I prefer to use black as a neutral color or camouflage for wildlife photography. Sizes are available from S up to XXL. If you want to know which size of rain cape is right for your lens(es), just measure the whole length of your lens including sun hood and camera. Now, you choose between the different sizes such as Small (11” or 28cm), Medium (17” or 43cm), Large (23” or 58cm), XL (27” or 68cm) or XXL (31” or 78cm). I wanted to test these rain capes during heavy rainfall and I must admit that Belgium is an ideal place to do so. During an open-air festival, I used these rain capes several times with the same excellent results. During one of the gigs, it was raining so hard that I really was not sure anymore that my equipment was still 100% dry. After the gig, I checked my equipment in the pressroom and everything was complete dry! Unbelievable, what a relieve! To use the Storm Jackets, you don’t have to own many skills. Just put your lens through the part that’ll cover your camera, then pull the rain cape over your lens and pull it all over the sun hood from your lens. Tighten the rubber bands and you are ready to go! At the back, you can cover your camera and the rubber band ables you to cover all except for viewfinder. 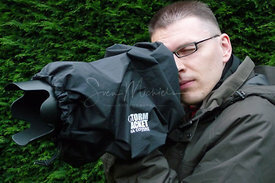 With the Pro-version, you can open the Velcro strip and put your hands under the rain cape to use your zoom lens. If you compare the Vortex Media Storm Jackets with other rain capes, you can only conclude that these are “simple, but decent”. It’s not just a plastic bag, but a decent rain cape in good material and perfect closures. Of course there are other rain capes for professional work, f.e. the Hydrophobia from Think Tank, but this will cost you 5 times more than a Vortex Media rain cape! 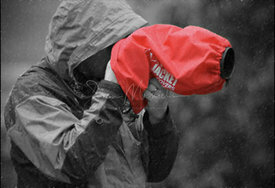 To pull the rain cape over your lens and camera is simple. If you want to use the rain cape however in combination with a tripod, you’ll need to open the Velcro opening at the bottom and then place the lens foot on your tripod and afterwards, you can close the Velcro again. You’ll need to practice to do it fast! For $36-59 (price depends on the version and size you want to buy) + shipping cost, you’ll receive a decent rain cape for your photo equipment. So if you can’t hide from rain, this simple rain cape is an ideal solution for a good price! The winner for the free give away contest of our Vortex Media Storm Jacket is James Van Roosbroeck!